Obviously I have been swimming, I rode my bike outside for the first time in over a month+, and I have been getting into the habit of running everyday. My runs have been short and sweet. I am enjoying them while they last since I know it is only up from here, both in volume and intensity. I have already been warned my off-season training will break down to be about 50% running so like I said I am enjoying my short runs while I can. One of the things I really enjoy doing is trail running. I did not know I enjoyed trail running until I moved to Charlotte. 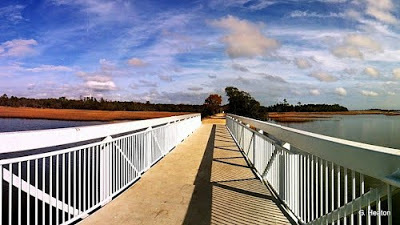 Trail running in Charleston consisted of running the West Ashley greenway, a non-paved flat trail running 8 miles out of town. It skirts behind some neighborhoods and strip malls before it snakes back towards the marshes and water the lowcountry is famous for. Unfortunately since I left I think the greenway has been paved so much for that little piece of running paradise. 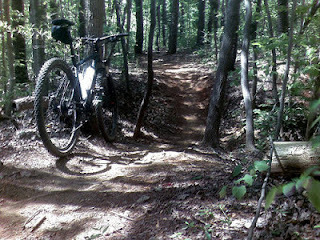 When I moved to Charlotte I was introduced to a whole new kind a trail running. The hard kind with lots of bumps, roots, steep climbs, and sharp turns. My first introduction to real trail running was a Renaissance Park. I love the difficulty of it but I especially loved how unpredictable the course was. As a garmin-data-addicted athlete I never really took the time to run trails even though my coach gave me a free pass to run them whenever and as often as I liked. When I started back a few weeks ago I decided to reclaim my love of trail running and I was dedicated to hitting a trail at least once a week. Sometimes love will make you do crazy things, like enter a trail race just as you are getting back in shape. I saw the Charlotte Running Company was putting on a race at the USNWWC and a got a little excited. I will be honest. I was planning to run the 4 mile. I totally thought the 4 mile was doable so I innocently asked my coach if I could pick what distance I ran out of the 4, 9, and 13 mile options. His response? "Yes you can choose, but not the 4 mile option :-)." Soooooooo I opted for the 9 mile instead. I also came to the realization fast cross country runner types in speedo-like running briefs often enter the short distances so really any way you look at it the 9 mile was really the best option. Getting ready to race was super easy and maybe took all of 5 minutes. I will never get over how much easier it is to race just one sport at a time. After milling about it was finally time to hit the starting line and even 5 minutes before the run started I had no idea which direction I was supposed to run in. It became fairly obvious pretty quickly and I just hoped to follow the masses. When the horn went off we darted to the trailhead. I was expecting a gut wrenching sprint to "get the holeshot" -the highly technical term where one sprints to avoid the bottleneck at the trailhead, no doubt coined by a dude- so I kinda sprinted but then I kinda didn't. Two girls were ahead of me entering the trail. The one closest to me was being super conservative which was probably smart because when I came to the first bridge I almost ate it by completely loosing my footing my first step onto the bridge. Screaming hysterically for a moment I gathered my wits enough to grab hold of the caution tape. Angels started singing, I didn't eat dirt, I knew I was saved. I caught the conservative girl quickly and passed her and unfortunately probably not with the proper trail running etiquette. Nevertheless I ran on and eventually caught the heels of a guy who ultimately tripped on root and faceplanted right in front of me. I stopped to help him but I still took the opportunity to pass him . . . . He later caught back up to me and fell again but this time he passed me and ultimately beat me to the finish line. There you go, what goes around comes around. Talking to him after the race I learned he fell a total of 4 times which put me to ease because I was starting to feel somewhat responsible for his crashes. I am not really sure what the proper etiquette is when trail racing. It seemed like a group would collect behind one individual and then everyone would pass him when just one person took the initiative to pass. I was content as long as I could see someone in front of me. I saw a few familiar faces working the water stops and their loud cheers seemed to resonate through the forest. I needed the pick me up because the last 20 minutes of the race contained the hardest and longest climbs of the course . . . . or I was getting tired. Knowing now how close we were to the finish, I should have fought harder to stay with "crashpad" after he passed me but that would mean hoofing it up the last hill and I was already done. I ended up winning the 9 miler for the women. Not a bad trail race debut and definitely not a bad showing for my first race back. I will take it and I may just sign up for a few more.